India vs Australia Women's T20 Highlights: India beat Australia by 48 runs in a group B match of the ICC Women's World T20 on Saturday. India vs Australia Women’s T20 Highlights: India beat Australia by 48 runs in a group B match of the ICC Women’s World T20 on Saturday. Electing to bat, India posted 167 for 8, riding on Smriti Mandhana’s 55-ball 83 and skipper Harmanpreet Kaur’s strokeful 43. India then returned to restrict Australia for 119-9 in 19.4 overs to continue their unbeaten run in the tournament. Alyssa Healy was absent hurt following a collision with Megan Schutt in the Indian innings. STUMPED! Poonam Yadav picks up a wicket in the first ball of the 16th over as Rachael Haynes steps out of her crease but misses the ball. Easy stumping for Taniya Bhatia. Ellyse Perry smashes three boundaries in the 15th over as Australia reach 90 for the loss four wickets. Pressure talking now. Gardner also tries to take the aerial route and ends up getting caught. India turning the screws here. Taken! Lanning goes for the sweep with the pressure building, Veda comes in to take the catch. Meg Lanning and Ashleigh Gardner in the middle and Australia are in a spot of bother here. Poonam Yadav dismisses Beth Mooney and Elysse Villani off successive balls and Australia suddenly find themselves on the backfoot. Two fours off Beth Money to start things off for Australia. Allyssa Healy is unlikely to play after that collision so there is extra pressure here on Australia. A wicket for Ellysse Perry off the last ball of the over; Australia need to make 168 to top Group B. Big collission between bowler and keeper. Healy and Shchutt go for the same catch after the ball balloons up in the air off the bat of Arundhati Reddy. Shchutt's shoulder has buried into Healy's face and she has to walk off the pitch. And that ends a magnificent innings, Mandhana comes down the track and lofts it to long-on, Ellyse Perry takes an easy catch. She had made 83 off 55. India have a good run rate but they are losing wickets far too frequently at the moment. Hemalatha tries to drag a pull from outside off and ends up playing on. Vlaemick the debutant jumps, plucks the cherry at that split second that she is suspended in the air, neither going up nor down, and then comes back to earth with the ball safely in her hands. That is a catch for the ages. Mandhana was given out but she went for the review. As it turned out, the ball had pitched outside leg and thus the decision is overturned. Two consecutive fours to start the over and the third is caught at cover and that is a big wicket for Australia. Harmanpreet Kaur is ensuring at least one boundary per over and the one for this over is a gigantic six over long off. "HARD KAUR" screams the jumbotron in the stadium. 50 partnership has also come up between the two best batters India have got. Australia certainly don't want this going any longer. Smriti Mandhana reaches her half century with a four, takes a single, Harmanpreet faces a dot and then deposits the next over long off for a six. India are looking very good at the moment. Mandhana has moved to 44 and her partner, Harmanpreet Kaur is on 4. Australia will be keen on getting her out when she is not in her Harmanator mode because the last time they played Harmanpreet in a big tournament was during the ODI World Cup last year. That must have been a forgettable experience for them. Oh, she sends an outside edge flying to third man off Kimminee. Villani was placed there for the catch and Rodrigues fell in the trap. Smriti Mandhana has switched gears here. The first ball of the fourth over ended in a mix-up but Jemimah Rodrigues survived that one. Mandhana then stepped down the track to hit the first six of the match and then another four. 13 runs came off that over in the end. Mandhana with an absolute beauty of a shot to send the fastest ball of the day between point and cover. That was the first boundary of the match. Bhatia goes the aerial route and is unable to clear the infield. Lanning moves a fair distance to her right and completes the catch. Taniya Bhatia and Smriti Mandhana have opened the batting for India and Tayla Vlaeminck bowled the first over. Mithali Raj was not warming up and sure enough, she isn't included in the playing XI. She had suffered a knee injury in the previous match. It's rather hard to believe that this year marks the first time in 10 years that India have made it to the semi-finals of the World T20 considering the fact that they are yet to break a sweat in any of their matches so far. But that stands to change today; as far as pay and basic domestic structures go, Australia are head and shoulders above the rest and that tends to show more often than not on the field. Australia won both T20 matches they have played against India so far in 2018. 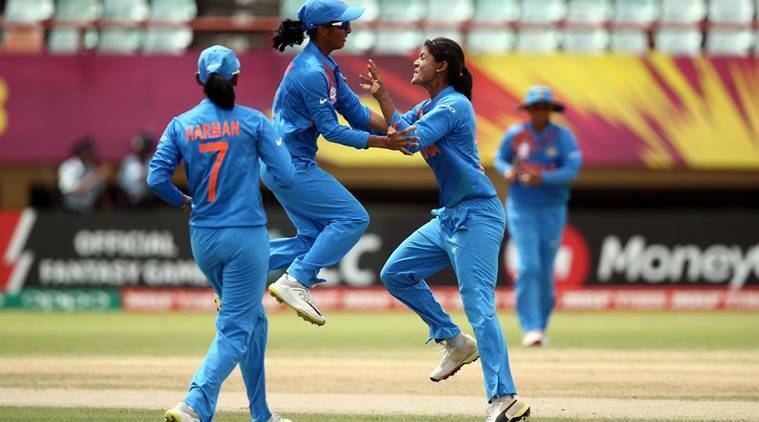 <strong>India vs Australia Women's T20 Highlights:</strong> India beat Australia by 48 runs. India vs Australia Women's T20 Highlights: Here is India’s route to the T20 World Cup semi-final in the West Indies, their first in eight years: Thrashed New Zealand by 34 runs, battered Pakistan by six wickets and smacked Ireland by 52 runs. Except for fleeting suspense against Pakistan, the rest of the victories were achieved without breaking much sweat, which was exactly what their coach Ramesh Powar had demanded before they embarked to the Caribbean Islands.